I felt like the painting by Millais, The Boyhood of Raleigh, peering out into the Salish Sea wondering what was going on out there, a not too distant horizon of islands and passages, mainland peninsulas and inlets, imagining. 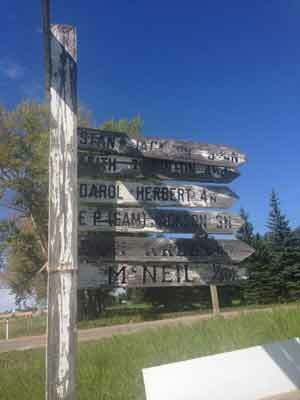 My home had been the city block, and Prairie backroads offered helpful signposts to the next farm. 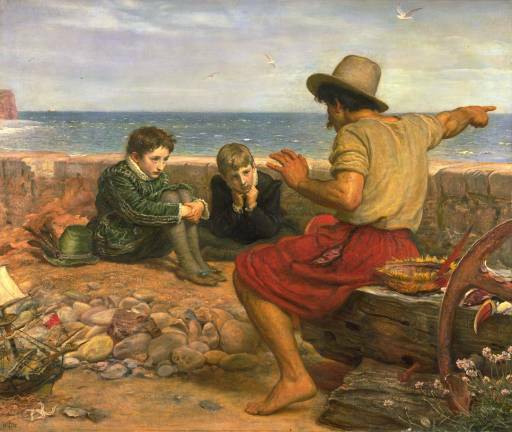 The Boyhood of Raleigh – John Everett Millais, exhibited at the Royal Academy, 1871. But, it is 2018, and I am connected. Beyond Siri, we needed to know what we were engaging with, the patterns of the day. First priority was – How the heck does this tide thing work? The bay is prety shallow, but large enough that you could get trapped out on a distant sandbar if not conscious of the tide and its schedule, also kind of nice to know, I discovered later, if breakers that are eating your soft landscaped breakwater (Logs and plants, enviro acceptable) will overwhelm you. You can say, OK, the tide has turned , it won’t get any higher. We won’t need higher ground. Now, thats great, I’m good so far, but I started wondering about the ships I saw passing by,headed for the Inside Passage, or headed for Bella Bella? 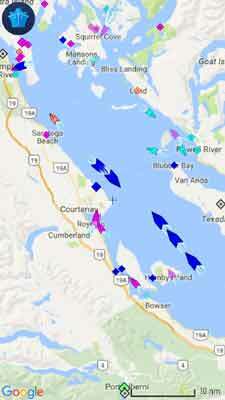 Enter Marine Traffic, an app that displays near real time positions of ships and yachts worldwide. Its connected to the worlds largest network of AIS receivers. AIS is The Automatic identification system an automatic tracking system used on ships and by vessel traffic services (VTS) for identifying and locating vessels by electronically exchanging data with other nearby ships, AIS base stations, and satellites.The app collects the you details of each vessel, where its coming from where its going, pictures etc. The website is Marinetraffic.com where they have Android and desktop versions as well. Cruise ships, tugs, yachts big and small and now I can keep tabs on them as they cruise past, good for checking the ferry too, but of course, I have pretty well figured out its route! Those big blue things are Cruise Ships, typically around 90,000 tons, coming from, or headed to Alaska via The Inside Passage. On a clear day the coastal mountain ranges appear, running back into the interior, and of course, then I needed to know the names, how high, how far away.Fo rthat I use a highly detailed mapping service provided by Topo Maps of Canada. Its not interactive but the detail, contour lines etc etc is superb and I can name a distant peak with confidence. And its source maps are National Resources of Canada, sounds official, so my taxes have already paid for it! Finally value for money. Our bay was once a part of the the K’omok First nation territories, before the scourge of disease and the march of colonization reduced their numbers and changed their way of life. There was a strong culture here, and we try to appreciate and respect its values. We are all natives of North America, European settlers and first nations no longer when we know and embrace the cultures that surround us. And they will have known about earthquakes, and so do I with my Earthqauke alert App. Quakefeed Eartquake Alerts , it could go on and on, endless ways to connect yourself to the place on the earth you occupy today. But are they really? The precision with which these tools locate themselves , and by extension, me, is subject to influence and variation, the precise coordiinates determiined may vary by a few metres , more or less, from time to time,, a multiplicty of locations over time. I include a link to an article in The Atlantic, describing the experience of an New York CIty exhibition which tracked the variations, and the conclusions they drew. I felt less sure of my connections after reading it but still comfortable with knowing that I’m probably close to knowing where I am.